In May 2000, Israel is reported to have secretly carried out its first test launches from two German-built Dolphin-class submarines of cruise missiles capable of carrying nuclear warheads. The missiles launched from vessels off Sri Lanka in the Indian Ocean are said to have hit a target at a range of about 1,500 kilometers [about 930 statute miles]. Israel is reported to possess a 200kg nuclear warhead, containing 6kg of plutonium, that could be mounted on cruise missiles. Israel has reportedly developed an air-launched cruise missile that could be operational by 2002, called the Popeye Turbo. The Popeye Turbo, with a range that is variously reported at between 200 km and 350 km, would appear to represent a turbo-jet powered cruise missile that may incorporate avionics and other components developed for the Popeye family of missiles. The AGM-142 HAVE NAP is a variant of the Israeli Air Force "Popeye" missile, which uses a solid propellant rocket motor. The Popeye II, also known as the Have Lite, is a smaller missile with more advanced technology. Designed for deployment on fighter aircraft, Popeye II has a range of 150 kilometers. 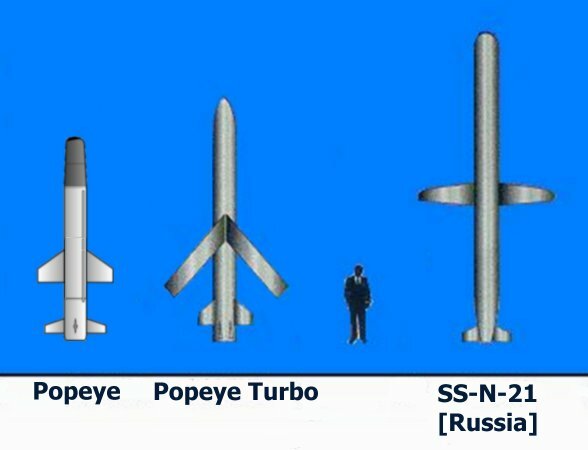 The Popeye Turbo missile is probably similar to if not identical with the Israeli submarine-launced cruise missile carried on the Dolphin-class submarines. The baseline Popeye missile with a range of 45 miles has a diameter of 21 inches, and is nearly 16 feet long. For comparison, the American MK-48 heavy torpedo is 21 inches in diameter, and 19 feet long, while the BGM-109 Tomahawk SLCM is 20.4 inches in diameter and 20.5 feet long [including the booster motor], and the Russian SS-N-21 SLCM is similar in configuration and dimensions to the American Tomahawk. The reported range of 1,500 km for the SLCM tested in May 2000 is several times greater than the previously reported range for the Popeye Turbo. However, the Popeye Turbo is a poorly attested missile, and the open literature provides little information on this system. Indeed, because of the small size of the vehicle and the limited testing program to date, it is entirely possible that even the US intelligence community has only limited insight into the capabilities of this system. There is no particular reason to doubt that Israel could develop a variant of the Popeye Turbo with a range of 1,500 km, simply by lengthening the fuel tank associated with a 300-350 km variant reported by US intelligence. At present it is not possible to determine whether the US intelligence has under-estimated the range of this missile, or whether news reports have over-estimated the missile's range. The longer range reported in June 2000 is certainly consistent with Israeli targetting requirements. It is generally agreed that these submarines are outfitted with six 533-millimeter torpedo tubes suitable for the 21-inch torpedoes that are normally used on most submarines, including those of the United States. Some reports suggest that the submarines have a total of ten torpedo tubes -- six 533-millimeter and four 650-millimeter. Uniquely, the Soviet navy deployed the Type 65 heavy-weight torpedo using a 650-millimeter tube. The four larger 25.5 inch diameter torpedo tubes could be used to launch a long-range nuclear-capable submarine-launched cruise missile (SLCM).